Happy Friday, dear readers! I don't know about you, but I have found this week testing my patience more days than not. I'm glad to have the weekend with no specific time commitments and activities for myself or the kids, although the hubby will be leaving town for work so I do have some solo parenting ahead of me. Here's hoping my littles take it easy on me next week! The month of April is rapidly coming to an end, and that means another Polish Pickup opening is upon us! If you aren't familiar with Polish Pickup, let me fill you in! Each month, themes are suggested and voted on by nail polish enthusiasts. Once a winning theme is named for the designated month ahead, indie polish makes pick their own specific inspiration based off the theme and work there magic. At each Polish Pickup opening the first Friday through Monday of the month, shoppers can purchase products to their hearts' desire from the brands, and in roughly three weeks, receive a single package containing all their goodies. It is not a subscription service, and it is not a themed box where you have to pay one price and receive everything. Polish Pickup is about purchasing on the months you want and only buying the products YOU want. It's a fantastic idea, especially since you don't end up having to try to resell a nail polish you didn't want to begin with. Even without the commitments, if you are new to the shop, I have to warn you that it may not be easy on the wallet. There are several makers that participate each month, and they have released some seriously stunning beauties! In anticipation of the shop opening next Friday, I have the pleasure of kicking off with revealing a few beauties I have had the pleasure of testing out. Let's do this! 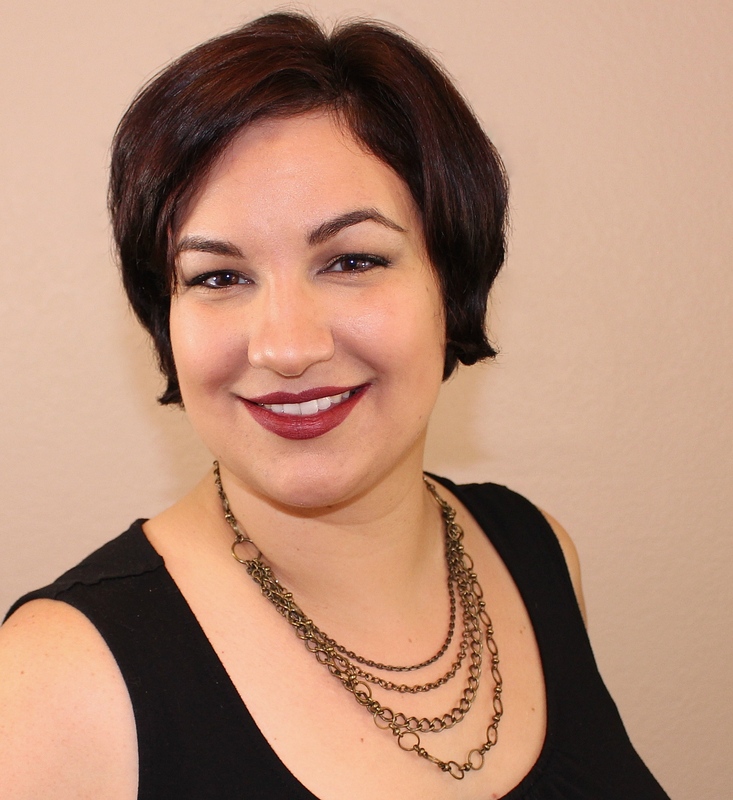 The theme for the May Polish Pickup is the 1990's, and indie maker Christy Rose of KBShimmer picked one of my all time favorite movies as her inspiration: Office Space! I quote this movie more than I care to admit, and it always makes me laugh when I see a red stapler. Poor Milton was treated horribly by his boss at Initech, even taking his beloved red Swingline stapler away from him. In the end, Milton had the last laugh against the company, and I am sure he did end up with his stapler, although we never actually see it in the end. If you haven't seen it, I recommend checking it out! Obviously, Christy is a fan of this movie as well and pulled her inspiration from Milton and his Swingline. 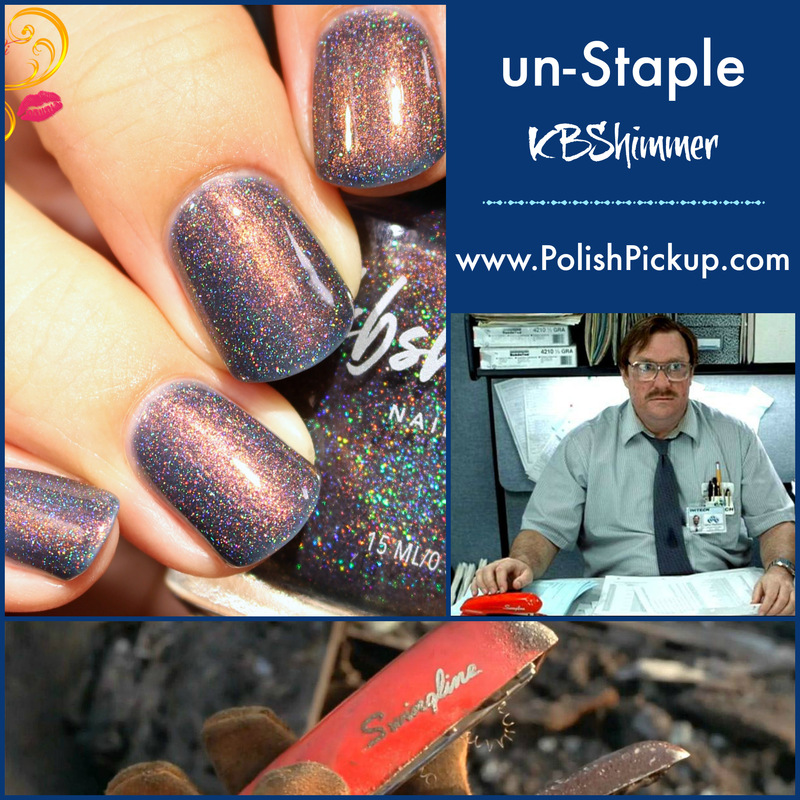 Presenting the KBShimmer shade for the May Polish Pickup: un-Staple! un-Staple is a stunning blue-grey jelly based polish filled with micro holographic flakes and a beautiful coppery red shimmer. As expected as a jelly, the formula is a little on the sheer side, although I did manage to get away with using just two carefully placed coats to reach full opacity on my shorties. Had my nails been any longer, I undoubtably would have needed to add a third, but this beauty is well worth it! Alternately, if you want to make your bottle last longer, you can layer it over a base shade. My photos are shown with two coats plus KBShimmer's Clearly on Top top coat. un-Staple will be available for purchase at www.PolishPickup.com from Friday, May 4th through Monday, May 7th ONLY. This is a short window, and this is the EXCLUSIVE to the Polish Pickup; be sure to mark the days on your calendars so you don't miss out! It will retail for $10 per bottle, and there is no limit to how many bottles will be made! Are you looking forward to the opening of the May Polish Pickup? Will un-Staple be on your shopping list? I'd love to hear from you! Zowie, that polish is GORGEOUS and your swatch shows it off, beautifully. What a great inspiration. The polish is really beautiful and now I want to un-Staple. This one is on my list - not just because it's KB Shimmer, but the unique shade is stunning! Un-Staple is so pretty and fun inspiration! You really captured the holo in this polish, more so than any other swatches I've seen so far. I had a meh feeling about this one I thought it was pretty but kinda dark for this time of year but no after seeing your photos I'm rethinking it all together. There is so much happening in this polish - love the shift, the sparkle, and the depth. While the base colour alone would have been more Fall-appropriate, all that shimmer and holo goodness make this wearable around the year. Love this one, it's already on my wishlist.